A great new day of kosen-rufu. As young buds start to uncurl and boughs tremble. And the Peace Memorial Park with its snow-white mantle. It echoes far across the eternal skies. The fresh air wafts away time. The distant Inland Sea shimmers with_ah, waves of gold! And glitters with_ah, waves of silver! Celebrates a new beginning for Hiroshima. For decades you have been said to be sterile. In the annals of human history. Striking out nearly two hundred thousand precious lives. Binding them up, making it hard to get work. Parents wept over their daughters’ future, day after day. Of the approaching footsteps of nuclear arms race. “We, the people of the world, have a right to live. Is a devil, a Satan, a monster. . . .
As his primary will, to be carried throughout the world. He uttered that warning to awaken the world. The most fundamental of evils. At the mercy of their own fundamental darkness. Struck at the source of their delusion. Time has flowed on and the times have changed. Thirty years have passed since he left his last will. This we can call a victory for us all. And the Soviet leader envisioned the shape of the future through the words of Emerson. of perseverance, dialogue, and trust. And of individuals over nations. everything save our modes of thinking, . . ."
Has now finally shaken loose and begun to evolve. As the king of faith and the champion of humanity. This was my honorable pledge, as a disciple of my master’s. Does history itself seek the royal road? In the midst of a severe attack by the devil of his illness. If he went it was certain he would die. My courageous master reproved me. I cannot change what I have chosen to do. As a man, I will go even though I may die. He could not rise from his bed. Just after his historic declaration. And heard the reviving words of my master in my ears. That day the city looked peaceful. And white doves leisurely turned about in the blue sky. Hiroshima now belongs to the world. A vow: No more atomic bombing. Or treated as instruments of propaganda. The Peace Memorial Park bustles with people. 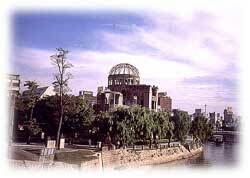 O my dear noble friends of Hiroshima! You have courageously arisen from the ground of sorrow! And cried over your own miserable lot. With the Mystic Law of revitalization. Renewed your empathy for the war-torn. Great is the power of the people! So noble is the circle of our solidarity as world citizens. As I strolled around the Peace Memorial Park. to go to Hiroshima at the risk of his life. Forget not, Hiroshima of the world! Was born out of your passionate desire for peace. This desire is the heart of Hiroshima. And the desire of our five billion friends on Earth. Longing for another world still linger. and the blizzard of isolation fell. While repeatedly pushing back the tears of vexation. My proud friends of Hiroshima. You have won at last! To the rest of the country and the entire world. To creating the felicity of world peace. from the warlord M_ri Motonari. With the power of solidarity, one in mind. nor selecting the best from opposite points of view. Arising naturally from the depths of your lives. What bonds of the past have brought you to this land? Never to be defeated by anything. Not only in Japan, but also in the world. And from degeneration to triumph. Looking to the light glimmering on the Inland Sea. of eternity shall shine forth. Brightly showing off the Atomic Bomb Dome. The glorious morning has finally come. Will now stand up as the dome of true peace.